Uploaded a Festschrift for Ray Brown. Updated list of CONLANG posts. Added a link to the CBB and fixed the link to the CONLANG list. Added a note on Britainese to Farewell to romlangs. Fixed a few links that were broken. Some link maintenance (removed a dead one, one that is no longer useful, and updated another link that has changed). 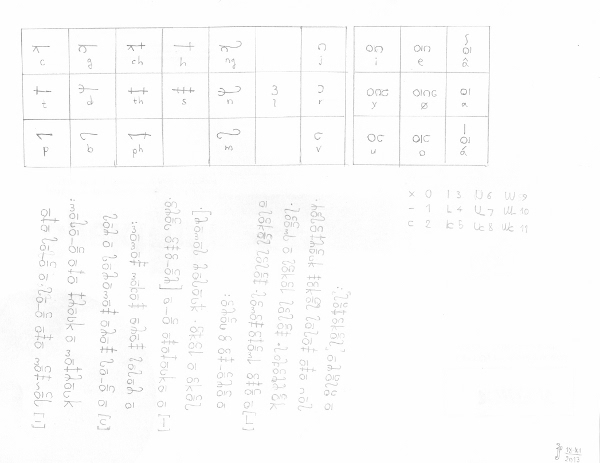 Uploaded Old Albic script, Roman Germanech, Proto-Timtu and Farewell to romlangs. Added links to Proto-Alpianic and Proto-Razaric. Fixed some links that have changed. Added The Art of Conlang Classification. Removed a few dead links. Added the Conlangers' Jargon File. Added links to Fiat Lingua, Typological tools for field linguists, Inspirational Natlangs, Zompist Bulletin Board (new location), Dothraki, Okuna, Teonaht (new location). Added links to Trinesian, The Conlanger's Library, Ars signorum, Ceqli, and Volapük. Removed a dead link and one pointing to a compromised site. Added links to Shallow Fith, David Peterson's web site, Speculative Grammarian and Rikchik; fixed link to Ithkuil. Fixed link to Feorran, also link to AkanaWiki on the Çetázó page. Added link to Jan van Steenbergen's home page; updated a few other links. The ZBB has moved; link corrected. Expanded The Caucasian languages and The Celtic Languages. Added links to IEED and Nostratica. Updated some links that have changed. Added links to Na'vi and Láadan. Modified and extended A brief history of conlanging. Added links to Dritok and the Gripping Language. Added a note to Auxlangers vs. Artlangers. Added links to BPJ's pages and Jim Henry's conlang stuff. Modernized layout; made several corrections. Added link to CONLANG list FAQ. A new conlang of mine is born! Added links to League of Lost Languages, SF Xenolinguistics, Itlani, Tsolyani. Updated Some of my posts to the CONLANG Mailing List. Added Some of my posts to the CONLANG Mailing List. Added link to the Language Creation Society. A few minor changes to Standard Average European. Added link to Leipzig Glossing Rules. Removed the link section in International auxiliary languages. Fixed a few links; made minor amendments to What's wrong with euroclones? KneeQuickie is back, but Langmaker died. Added a section to Where Esperanto got it wrong. Restored link to the ZBB (while it has its content quality problems, it is quite useful, and after all, I still have a link to the even more vitriolic AUXLANG list); removed some remaining links to KneeQuickie which has died. Added a linguistics subsection to the Links section. Removed links to Klingon Wikipedia (it apparently has been deleted), the Zompist Bulletin Board (dissupported due to low discussion quality and objectionable content, especially right-wing American politics), and the Conlanger Bulletin Board (dissupported due to the same problems but worse). Added new maps to The Caucasian languages and The Celtic languages. Langmaker is no more; removed from the link list. Corrected two errors in The Caucasian languages. Added link to Latino sine flexione; made some minor improvements here and there. EAK has been renamed and moved, it is now TAKE; added link to List of self-segregating morphology methods. Added links to Ellênikó áneu Klísi, Phaleran PDF grammar, and Latejami. Added links to Phaleran, Yivrian, Silindion on FrathWiki; the old link to Feorran no longer works, but the Wayback Machine still has it (link corrected). Added link to Henrik Theiling's conlangs. Expanded the syntax section of The Celtic languages. Added links to Feorran, Toki Pona, Novegradian and the Correspondence Library on KneeQuickie. Added links to Ithkuil and Ilaksh. Added two subsections to Desigining an international auxiliary language. KneeQuickie has died; link removed. Made minor changes to A brief history of conlanging and The Celtic languages. Uploaded A brief history of conlanging and a new, extended version of The Celtic languages. Corrected a few mistakes in Where Esperanto gets it wrong. Thanks to Michael S. Repton for pointing them out. Added links to Classical Kasshian, Klingon, Teonaht, Tokana, Briefscript, Esperanto, Lojban, Novial, Introduction to romlangs, and Essays on Language Design. Uploaded The Caucasian languages and The Celtic languages.